There are a few best practices that have become common place and are expected by customers across subscription programs today. These include a simple and easy cancel or skip process that can be done at any time and subscribe and save discounts. Consequently subscriptions feel less binding and are a more helpful service that saves the customer money. 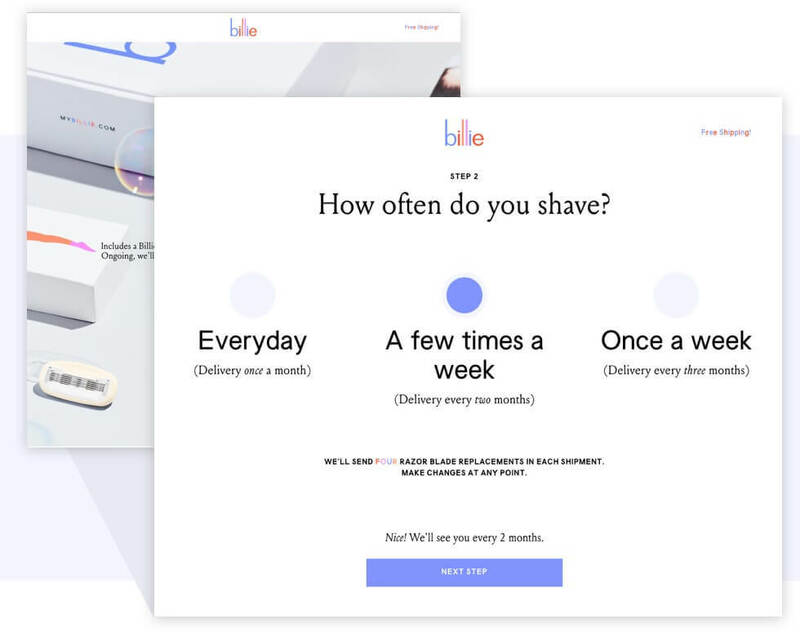 Billie, a high-quality, fair-priced razor company targeting women, walks their customers through a simple three-step questionnaire when they are ready to purchase. After selecting their desired razor handle color, a customer is prompted to choose how often they shave, with each answer indicating how often a pack of 4 razors would consequently be delivered to their doorstep. 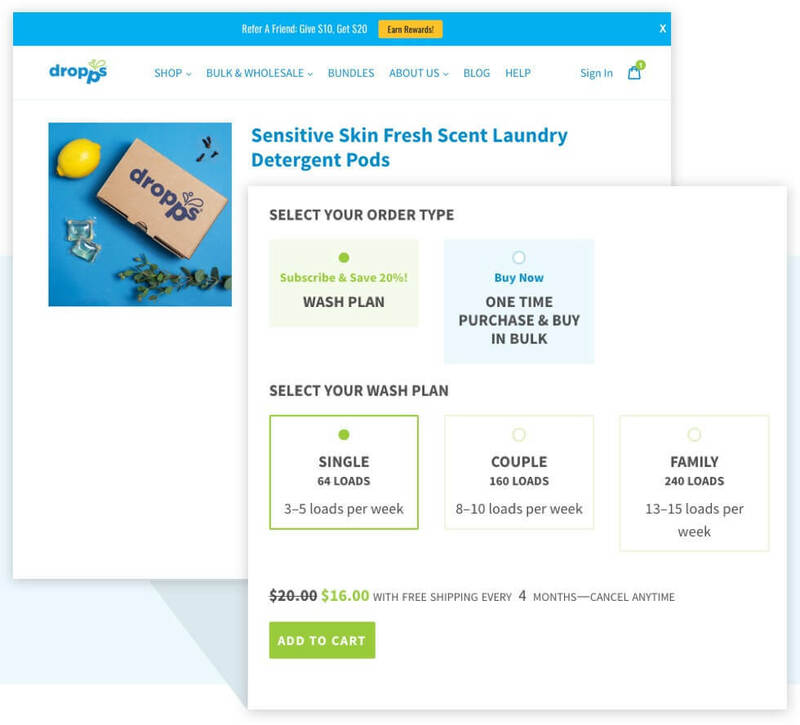 Similarly Dropps, a company committed to making natural, sensitive, eco-friendly laundry detergent pods, asks its customers to select a wash plan that corresponds to the number of loads of laundry they typically do per week. If the customer is still undecided, Dropps provides descriptors such as “single,” “couple,” and “family,” along with the number of loads that plan will cover. One of the biggest advantages here is that when we start quantifying a customer’s usage, we move toward making a more accurate delivery schedule of that product. If we mitigate a customer’s surplus of a product, the chances of them canceling their subscription becomes less likely. 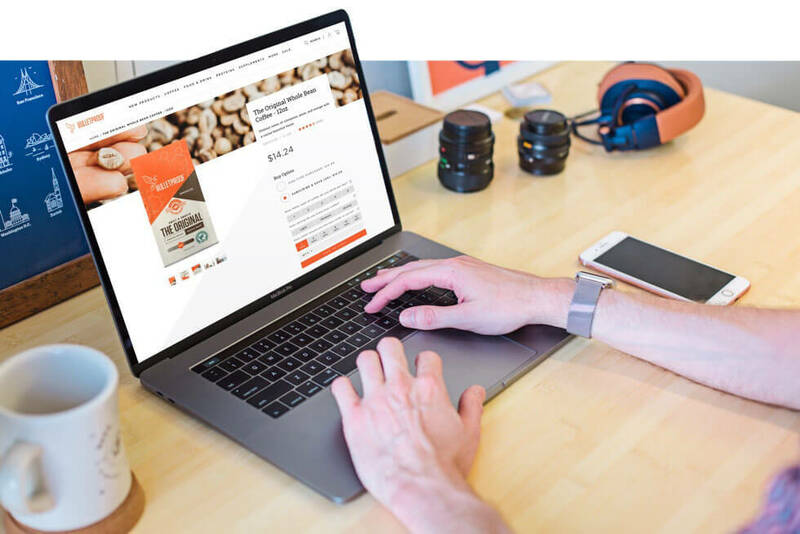 Bulletproof, a nutritional company dedicated to helping people perform better, think faster, and live better lives through their line of supplements, foods, and technologies, does an excellent job of formulating product quantity based upon a series of customer questions. 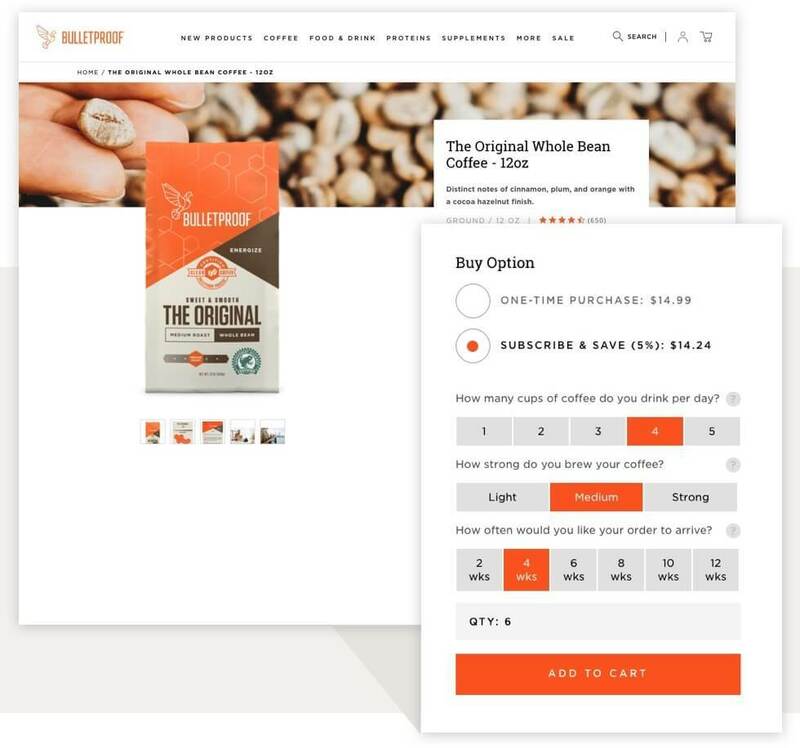 After deciding to subscribe to one of Bulletproof's original whole bean coffees, a customer is asked to answer simple questions like the number of cups of coffee they drink per day, how strong they brew their coffee, and then how often they would like their order to arrive. Based upon these answers a quantity of bags is generated for the customer to conveniently add to their cart. The advantage here is presented in an upsell opportunity that has the potential to increase a customer’s cart size. Although I may approach a subscription program expecting to only have to snag one bag of coffee a month, after taking a quick questionnaire, I am enlightened to the fact that I will actually need three bags every month to fuel my caffeine addiction. The customer cart size has tripled by asking a few simple questions. The common thread throughout all of these examples is the implementation of a conversational questionnaire that is simple yet effective and ultimately determines the usage and/or quantity of a product to fit a customer’s needs. The concept may seem obvious, but imagine the loyalty you would gain from your customers if your subscription process gave them the right amount of the product they loved exactly when they needed it. The important thing to keep in mind is that happy customers are retained customers. If a service adds value and fits seamlessly into a customer’s lifestyle it is unlikely they won’t find a need to cancel it. Retained customers means more consistent revenue that your business can build a successful business model around.